Like countless kids across this country, Lee Francis grew up reading comics, imaging himself a part of spectacular worlds filled with powerful heroes. And like most fans, he looked for himself in those heroes. But Francis’ family is Laguna Pueblo, and the Indigenous characters in mainstream comics he encountered were rife with stereotype. So when he got older, he started his own comic book company and went on to establish Indigenous Comic Con. 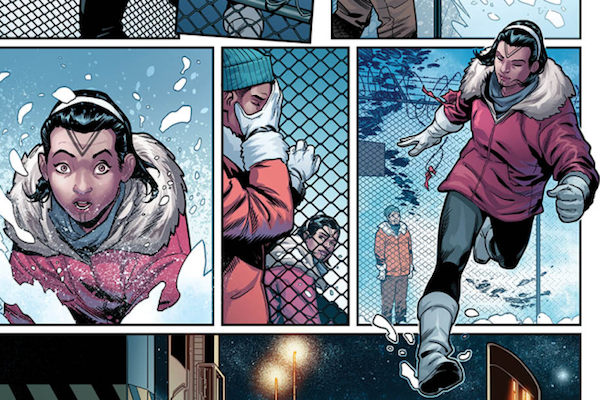 Last month, Marvel Comics put one such thing in play — potentially — when the industry giant behind Captain America and Spider-Man announced it would introduce a new female Indigenous superhero: Amka Aliyak, alias Snowguard, a 16-year-old Inuk from Pangnirtung, Nunavut. Snowguard writer Jim Zub, an Anglo-Canadian who also writes for Avengers and Samurai Jack, among others, told me that when he was creating Amka’s backstory, he wanted her to be the exception, not the rule. Zub reached out to Nyla Innuksuk, a member of the Inuit community who helped him not only create the character but to also understand her world. This, he hopes, will give more dimension to the character, something the comic world needs. Marvel writer Jim Zub said he wants Amka to be a Native character not just through her powers but through thoughtful illustrations of what life for real Indigenous teenage girls in Nunavut is like. While Amka’s powers are based on animal traits, a characteristic often ascribed to Native heroes, and she has Inuit tattoos on her face and arms, Zub said her realistic story, background and look are all part of a research process that will remain ongoing. There have been dozens of Native characters in American comics over the decades, but rarely have they been thoughtful or insightful illustrations of Indigenous people. Face paint, leather fringe and feathers typically adorn these heroes, as if cultural identity must be tied to their power. But that identity is fabricated, crafted by writers with no knowledge of Indigenous communities who utilize popular myth to create their characters. Francis, who produces comics about Native superheroes and Navajo Code Talkers and anthologies of art by Indigenous women, said he wants young Indigenous readers to find the same inspiration in comics he did but without the reinforcement of false narratives and myth. Francis said he was thrilled to learn that Zub made so much effort to consult Inuit people when creating Amka, but he would also like to see more Native writers at the larger comic book companies. Not only would it be a career-builder for any number of talented Indigenous writers, it would be an excellent way to explore true Native identity and showcase it to a much wider, non-Native audience. Note: An earlier version of this article incorrectly spelled the title of the comic book series Black Panther.